When I load PluginManager I get this error string: Failed to resolve package "". Has it happened to anyone? Would it be possible to add a third column for version number? Also, could the Author column be made wider as there are some authors (or pairs of authors) that are too wide for the current column width. Great plugin! I just wish Turbine would add an automatic load of this when you logged onto a character! Agreed. I use plugin manager and KragenBars and do not experience any crashes. It's only when I load any other addon (moormap, compendium, especially sortpack, etc) that I start crashing. PluginManager is not causing any crashes at all on my end. WARNING: This plugin is currently crashing clients in Rise of Isengaurd. The specifics of why is unknown. I havn't found out weather or not it has to do with any other plugins or just itself, but as i load other plugins without using the manager I have not crashed. Keeps it so much more simple. I've created a shortcut on one of my extra quickslots, and just click that, and all the plugins I use on a character are pulled up. It's is so helpful and quick for loading or unloading plugins, I love it. And the added ease of just typing /man to open the list is priceless. Also, for another user that was having loading issues, make sure to type in "/plugins refresh" before trying to load new plugins. The client doesn't check for plugins at start-up and needs this command to search out new plugins. Any way I can get a more detailed error display so I can try to pin down what the problem is? This sounds like a great Plugin & I'd love to get it working. I am having problems loading this. It doesn't really error or anything, it just says "unable to load manager". I'm not exactly sure what I am supposed to do to fix that. EDIT: It started working on its own so nevermind. Last edited by Kaltic : 03-26-2011 at 11:23 AM. 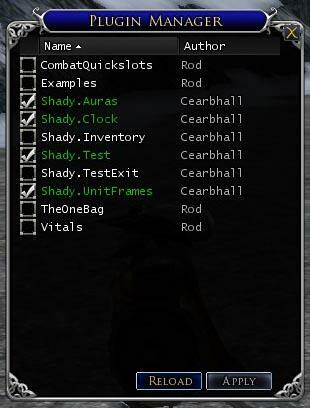 The Lord of the Rings Online\Plugins\Turbine\__init__.lua:6: Failed to import package "Turbine.Event". Any chance you could create a way to let the user load plugins in a certain order? Update for 'nil value' error? 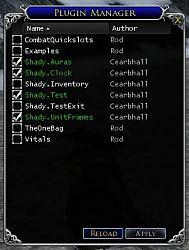 ... the Rings Online\Plugins\Shady\Manager\__init__.lua:27: Failed to import package "Shady.Manager.window". This is with latest version of PluginManager04 and latest turbine packages and no other plugin installed. Any news on an update or fix? Last edited by Nibiru : 02-09-2011 at 05:42 PM. I just wanted to bump this up, as its very handy. A mechanism where PluginManager would read from an easily editable file to load plugins if it does not detect PluginManager save data, with necessary safeguards in place to prevent loading a plugin that's not there.